Crestor is used to help prevent the body from producing excess cholesterol to lower the risk of heart disease. Learn the usage, dosage, side effects, etc. Crestor is a HMG-CoA reductase inhibitor which slows the production of cholesterol in the body, which helps ensure more quality blood flow to key portions of the body such as the heart and brain, as well as increasing circulation levels throughout the body. This may also help the body clear cholesterol that has built up along the arteries which blocks the flow of blood. It is intended to be used alongside diet and exercise to help manage these conditions. You may also be prescribed other medications simultaneously to help manage a preexisting heart condition. 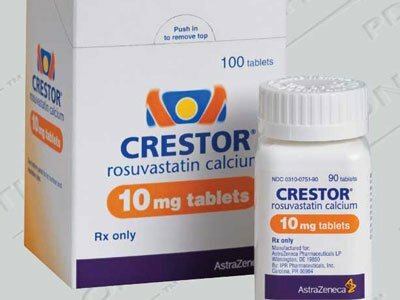 Crestor is the name brand for rosuvastatin, which is used to help reduce the risk of developing heart disease, heart attack or stroke by assisting in the management of cholesterol levels. It is a tablet that is to be taken orally once a day. Patients should try to take their medication around the same time every day to help ensure a steady stream of the medication in their bodies. If you forget to take a dose, take one as soon as you remember, unless it is within 12 hours of the time when you should be taking your next dose. You may take this drug with or without food. In many cases, patients will be started on a low dose which will be increased as necessary to manage your condition. Do not alter your prescription or stop taking your medication without instructions to do so from your doctor, as this can lead to a dangerous reaction in your body. Most patients will be instructed to eat a low cholesterol-diet while using the drug. This may include avoiding fatty meats, egg yolks, whole milk, butter, pastries, cakes, peanut butter, chocolate, olives, fried foods, cheese or olives. You may also be instructed to increase your intake of poultry, egg whites, and monounsaturated oils such as olive oil, fat-free milk, cottage cheese or fish. Your doctor will give you detailed instructions as to how to manage your diet based on your personal nutritional requirements. This drug is available in 5, 10, 20 and 40 mg tablets. Most adults over 17 will be started on 5 mg per day which will be increased up to 40 mg per day as necessary. Children between the ages of 10-17 will be given an initial dose of 5 mg per day which can be increased up to 20 mg per day as necessary. Children under the age of 10 should not be given this drug. Who Should Not Take This Drug? Those suffering from liver disease may not be able to take it as this medication can worsen your condition. Talk this risk over with your doctor to determine if you need to take a lower dose to ensure that the medication can be cleared from your body efficiently, or if you need to avoid taking this drug all together. Pregnant women should not take this drug. This drug has been rated in pregnancy category X due to the extreme likelihood that it can cause birth defects in your unborn child. It may also be dangerous to take this drug while you are breastfeeding. Talk to your doctor about the potential risks and determine a safe way to continue managing your condition should you become pregnant while using it. Side effects include constipation, joint pain, heartburn, dizziness, memory loss and confusion, difficulty sleeping, depression and cough. In most cases these side effects are not serious and should be eliminated within a few days of taking your medication regularly. If your symptoms become worse or they are impacting your ability to function normally, contact your doctor to report them. Your doctor may recommend an alteration to your prescription to help combat these reactions. Do not alter your prescription in any way unless given medical direction to do so. If you begin to suffer from muscle pain, lack of energy, fever, chest pain, pain in the upper right abdomen, sore throat or tingling in the fingers and toes, nausea, extreme fatigue, loss of appetite, weakness, unusual bleeding or bruising and flu-like symptoms, you may be suffering from a severe reaction to this drug. Contact emergency medical services to get assistance right away. Taking large doses of this drug, particularly large doses that have not been recommended by your doctor, can lead to skeletal muscle effects.This drug can contribute to the breaking down of muscle tissue, which can increase protein levels in the blood. In addition to the damage this may do to your muscles, increased protein levels in the blood can lead to liver damage. If you begin to show signs of liver disease, including changes in urination, yellowing of the skin or eyes or increased liver enzymes,make an appointment with your doctor right away to get tested for liver damage. If you suddenly begin to experience hives, rash itching, hoarseness, difficulty breathing or swelling in the face, hands ankles or lower legs shortly after taking your prescription, you may be suffering from an allergic reaction to Crestor. Contact emergency medical services immediately to get treatment and talk to your doctor about whether or not it is safe to take your next dose. Medications known to interact with this med include atazanavir, clarithromycin, cyclosporine, daptomycin, erlotinib, fenofibrate, fenofibric acid fosamprenavir, gemfibrozil, indinavir, lopinavir, niacin and saquinavir. Inform your doctor about any medications you are taking to help avoid a potentially serious condition or overdose on medications with similar ingredients. You should also tell your doctor about any over-the-counter medications or supplements you take regularly in case any of these may interact poorly with your treatment. You should not take antacids containing aluminum or magnesium within 2 hours after taking it. You may also experience a negative reaction from medications including cimetidine, spironolactone, blood thinners or birth control pills. These medications also affect the circulatory system and may combat the efforts this med makes to regulate these functions. Do not drink alcohol while using this med. This can increase the risk of liver damage, which could lead to a potentially fatal reaction. If you are suffering from heart disease or a circulatory condition, your doctor may also tell you to stop using tobacco while you use this drug. Trazodone is used to treat depression and other mental disorders caused by a serotonin imbalance. Know its effects. side effects, interactions and more! What Side Effects Do Biotin Has? Enlarged Heart: Symptoms, Causes and So Much More! CopyRight © WWW.MD-HEALTH.COM. Last Updated 23 April, 2019.